Louisiana closed out their last fiscal year with a $120 million surplus. Now, the Louisiana Legislature needs to decide what to do with those funds — because they legally can’t be used to balance this year’s budget. 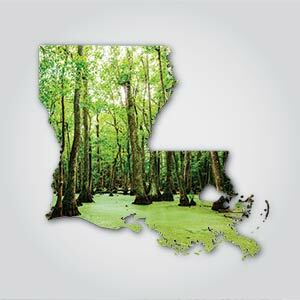 But that extra money can be used to safeguard Louisiana’s future — by helping rebuild the disappearing wetlands Louisianians rely on for protection from storm surge, recreational pastimes, and crucial economic drivers. Take action today, and tell the Louisiana Legislature to invest in Louisiana’s future. I am asking you to direct surplus dollars from the state's budget into the Coastal Protection and Restoration Trust Fund to the maximum extent possible. The coastal trust fund has been reduced in recent years due to mid-year funding sweeps and a reduction in mineral revenues from state lands. The fund is also one of the only eligible funds that may legally receive surplus dollars. As a representative of our state, you know all too well that our coast is vitally important to communities, wildlife and the economic health of the entire country. We cannot afford to lose any time when it comes to restoration and protection, and we need any and all available funding to address our land loss crisis. Please be vocal in advocating for surplus dollars to go to the coastal trust fund. We need to increase cash flow for project implementation and also replenish a program whose funds have been decreased in recent years due to fund sweeps and reduced mineral revenues. Thank you for your consideration and support.